MARCELL: Growing up I would always have breakfast at Kupat Tahu Gempol, tel: (62-22) 426 0809. This food stall has been serving its famous dish of tofu and peanut sauce since 1965 and now has four other stands around the city, but the same woman still works at the original location, which is down the road from my old house. Just around the block is one of the city's best boutiques, God Incorporated, tel: (62-22) 423 2308. It sells locally made clothing and other gear, and belongs to the members of Koil, Bandung's legendary metal band. The shop has great T shirts, DVDs, books and band merchandise. After going there, head over to Invictus, tel: (62-22) 250 4407. I love the cotton they use in their T shirts. 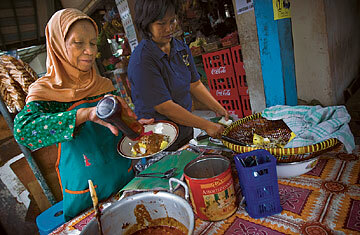 DEWI: After some shopping, head to Toko You, tel: (62-22) 250 3332, one of the best-known cafés in town. But instead of caffeine, have a small shot of jamu, or herbal drink. For some reason, they taste better there. I recommend the sweeter kind, like beras kencur, made with kencur root and rice powder. It's good for beginners and not as bitter or medicinal as the jamu more experienced drinkers enjoy. For lunch, I've always loved Warung Nasu Ibu Eha, tel: (62-22) 426 2745, a little food stall deep in the heart of Pasar Cihapit, one of the city's oldest markets. I've been eating there since I was a kid and the menu still hasn't changed. I love the perkedel (corn fritters), rice noodles and the fried tofu. Or you could try picking something up at Het Snoephuis, an 80-year-old Dutch bakery also known by its Indonesian name Sumber Hidangan, tel: (62-22) 423 6638. The same lady has been working as a cashier there for 48 years. After lunch, head over to the Reading Lights bookstore, tel: (62-22) 203 6515, and browse through their collection of used books. You'll mostly find titles in English and they also have a nice gallery upstairs where you can buy the work of local artists. MARCELL: Next you can move on to DU68 Music, tel: (62-888) 235 8890, and check out the used CDs. They have a great collection of 1980s music and a pretty good collection of local stuff if you want to check out some music from Bandung. For dinner, we suggest Sambara, tel: (62-22) 420 8757, for some of the best Sundanese food  the cuisine of West Java. All of the dishes are spread out on a long buffet table so you just choose what you like and they'll heat it up and bring it to your table. It's a great place for vegetarians like us, as the Sundanese eat lots of raw vegetables and sambal, or chili paste. The place is cozy and the people friendly, so we love to come here after a long day and just enjoy the breeze at a table outside on the terrace.